Today, the key role in the tourism sector is played by the Internet: new travelers use the Web during all phases of traveling process: before the departure for inspiration, research, and booking; during the travel for local services and information; and after the journey in order to share impressions and give suggestions to other travelers and communities. 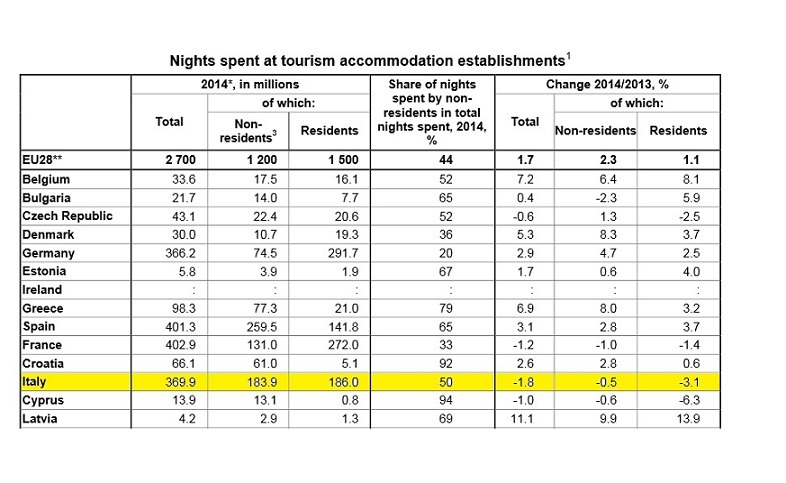 According to Eurostat(1) in 2014 the number of nights spent in EU tourism accommodation establishments reached a new record: 2.7 billion nights (+1,7% on 2013). Italy faces several difficulties and continues losing position in global trends, but on the other hand it still has a dominant role in the world, thanks to its historical, cultural, artistic and natural heritage. Data elaborated by the School of Management Observatories(2) show that in Italy e-commerce revenues in 2014 are about €13.2billion (+17% on 2013), consumer goods represent about 40% of online trade, while services are about 60%, and tourism is a leading economic sector and probably the one with the most important growing chance. According to MM One Group (www.mm-one.com) tourism represents also the 33% of exports (about €2.5 billion)(3). The contemporary traveler visits almost 5-6 websites to decide destination, transport and accommodation, and changes almost 2 devices during the booking experience. He/she is dependent on smartphone during the travel, as shown by a recent research study commissioned by Expedia: 94% of leisure tourists travel with a smartphone, and 97% of business travelers bringing at least one device on every trip. It is clear that tourism is facing new challenges and opportunities offered by technology every day. On one hand, each technological innovation implies a new player trying to provide its own services and to boost its revenue adding new layers of complexity; on the other hand, technological tools give the chance to eliminate all levels of brokerage and to start a direct dialogue between Vendors and Consumers. The global travel trends for 2015 reveals some key words: mobile, seamless, experiential and “smart booking”. The latter is a synthesis of multiple operations and strategies setting up by OTAs, meta-searches and mobile applications to improve their own booking platforms (by offering, also and especially, someone-else’s products) in order to be sure that everyone will complete booking process on their own websites. All their intelligences are working on more elegant user experience that must be efficient, quick, easy, fun, comfortable, and so on. As reported by a recent article published in the Skift magazine, “meanwhile, companies such as Expedia and Hipmunk are investing in and developing seamless search, and booking from mobile device to PC and back again to handle consumers’ propensity to start their searches on one device and pick it back up again on another”(4). Today it is no more important “what” you buy, but “where” you buy, in a 2.0 meaning: i.e. on which web platform. – the Vendor: the hotel or airline itself. OTAs are (still) today a key actor in “vendor”’s sales chain. Especially for those hotels without a strong brand online presence and technological tools, OTAs can make the difference between success and failure, enhancing marketing efforts and sales revenues. Hotels pay commissions to the OTAs equal to 12-20% of total booking value; on average, an OTA makes approximately 30% of the booking revenue but it is not the same for all Online Travel Agencies and for all hotels. For example, Booking.com charges between 10-15% whereas Expedia charges between 18-25%. Big hotel chains or hotels sited in important cities and key places can offer 10-15% whereas standalone hotels offer 15-30% in terms of commissions. 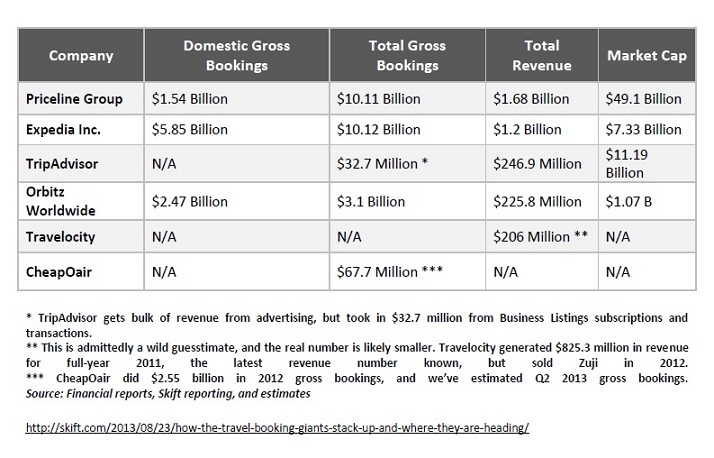 – The Priceline Group, including Priceline.com, Kayak, Booking.com, Agoda, and Rental Cars.com, is the largest global online travel player, and it is growing faster than Expedia, thanks to Booking.com’s lucrative hotel business; currently it offers more than 340,000 hotels, apartments, vacation rentals and B&Bs and has a 2013 revenue of $6.8 bn. – Orbitz with a “smaller” revenue of $800m. – Travelocity with TripAdvisor and a revenue of $944m. Nevertheless, their role is changing in some key ways and many hotels are moving away from OTAs, taking initiative in order to lead more traffic to their own websites, avoiding OTAs fees, and adding more to their own profit margins. Escaping from OTAs control is the recent attempt of many different hotels sometimes to grow, often to survive. A metasearch engine is a search engine where different OTA’s can be compared. Their revenue comes from the fee the OTA’s, on which the booking is eventually made, pays to the metasearcher. Metasearch marketing is an advertising model that typically utilizes the cost-per-click (CPC) advertising format, where the advertiser pays only when someone clicks on their listing and is taken deep into their booking engine. Techniques behind metasearch are now full-grown and also travelers are becoming more familiar with these kind of platforms. Consumers appreciate metasearch because this engineering system is liberating them from the need to compare five or six travel sites to book an hotel and from the information overload they got doing that. According to PhoCusWright, 54% of Chinese, 36% of American and 35% of British travelers use meta-search engines to compare rates. Kayak, which was founded in 2004, took four years to process 1 billion queries, but processed 1.6 billion queries in 2013 alone. This number is expected to triple by 2019. Qunar, a Chinese meta-search channel, processed 3 billion queries for flight and hotel rates in 2013 (Source: Tnooz). Especially in Europe, there is a big market for metasearch because of the lots of smaller chains and individual hotels that represents a great opportunity for aggregators. A lot of big and small chains but also individual hotels are thinking about meta search marketing like a way to escape from OTAs control and fees(5), thanks to direct connection from metasearch (definitely a cheaper distribution channel than OTAs) to the own hotel website. The aim it is not just more revenue but also a direct relationship with consumers to develop a real brand engagement and a growing fidelity. At the moment, the available results indicate that OTAs, especially the bigger ones, are getting however more prominence in (meta)search results. For example, still in April 2014, OTAs controlled 96% of booking listings in Kayak. Leading more direct booking to own website it is a good way to use metasearch, but it should be just a part of a marketing approach: SEO, SEM, social media, retargeting, emails marketing till to a real web reputation management. The battle is fierce and against “gorillas” but with intelligent bid-management and improved contents, hotels can gain good conversion rates. Going direct to metasearch gives hotel the chance to play with rate-parity and lowest price, but probably one of the most important way to earn positions is care about contents: photographs, accurate property information, video, storytelling and emotional engagement will certainly help hotels to improve page ranking. Sharing economy: a real disintermediation? The Sharing Economy is a socio-economic ecosystem built around the sharing of human and physical resources. It includes the shared creation, production, distribution, trade and consumption of goods and services by different people and organisations(6). In recent years, the common practice among friends to share goods has moved from a community practice to a business model and ancient concepts have evolved in “peer-to-peer” (P2P) networks, collaborative consumption or access economy. Some examples? Zipcar, a car-sharing service that allows members to rent vehicles by the hour, Uber that is like a Taxi but not a Taxi, or Airbnb, a peer-to-peer marketplace for lodging. Sharing Economy in Italy is spreading in different fields; there are almost 140 platforms, of which 30% are about crowdfunding, 20% about consumer goods, 12% about transport, 10% about tourism and 9% about job search(7). For tourism industry is like a little revolution: it is possible to visit a place, to have a bed, some guide and also friends just “sharing”: no OTA platforms can be so wide like “all the population of each place”. But not “all the population” is on a website, and not all the population on the same website is interested in sharing something, especially their own time or their own home; here it come the big difference between comparing “all the population” with “all the professional offers” without taking into account guaranties, reliability, branding, full disclosure and details, etc. In addition, a “sharing platform” is always a platform with some “intermediaries” that have to make orders (and revenues) and facilitate the match between demand and supply. The big difference is that the new world is required to organize no more simply a B2C (Business to Consumers) or a B2B (Business to Business) relation, but a C2C (Consumer to Consumer) or perhaps a T2T (Traveler to Traveler) connection; what is certain it is always and in every case a H2H relation, i.e. a Human To Human interaction. During the past few years, many platforms of “disintermediation” have been criticized by experts as well as by operators of the tourism sector. Often there is obviously a convenient position: those who work in an OTA cannot see positively the will of an hotelier to manage its own business alone, developing direct relations with customers and eliminating the OTA from the supply chain. In the same way a taxi driver obviously cannot have a good opinion of UBER that – with less fixed costs and no need for a license – becomes a competitor. However, I think there are two main aspects that need more attention. The first one is the fact that a virtuous choice – as an hotel that decides to manage independently its brand, trying to build a direct relation with customers and making an effort to understand the technological tools that have too long neglected – is done for the wrong reason: the unsustainability of OTA’s fee rather than the real willingness to recover a full dimension of its work (and so a higher quality and specificity of the supply). The other central topic is that the crisis has been a good stimulus for many small and medium operators to face the “gorillas”, the big leader of the tourism industry, that in several situations (and in almost all sectors) take the most of money, creating the less of value. Beyond the beauty of a model based on a logic of sharing and participation, absolutely positive in today’s world, there is a clear risk hidden in the “disintermediation” and in the sharing economy: the disappearance of professional services. (3) Although the importance of e-commerce for our economy, Italy occupies still today one of the bottom positions among European countries in terms of both e-commerce market’s penetration and Internet usage. (4) Dennis Schaal, “The Rise Of Ubiquitous Booking”, in SKIFT, Megatrends defining travel in 2015, Yearbook/Issue: 01, pp. 12-13. 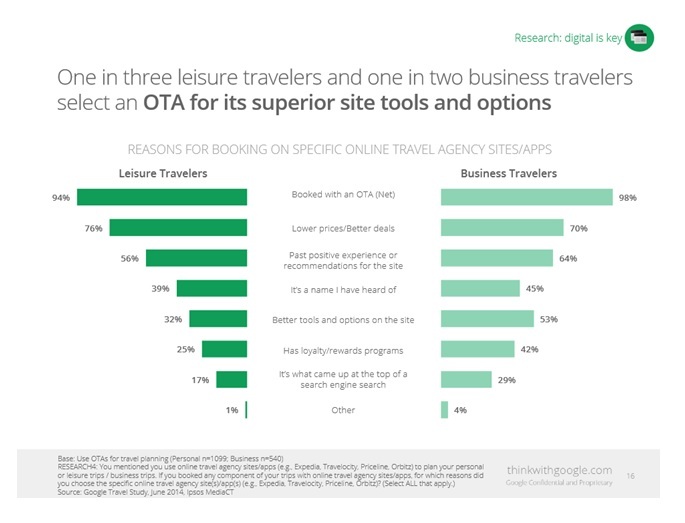 (5) Last year, more than 76% of online bookings for non-branded hotels came from the OTAs and just 24% came from the hotels’ own websites (STR, HSMAI Foundation). (7) A research curated by Collaboriamo.org in partnership with PHD Media and recently presented at Sharitaly.